Doggies - A Sandra Boynton Board Book Just $3.30! You are here: Home / Great Deals / Amazon Deals / Doggies – A Sandra Boynton Board Book Just $3.30! Doggies – A Sandra Boynton Board Book Just $3.30! Sandra Boynton books are easy to love. They have fun characters, terrific illustrations and engaging stores! 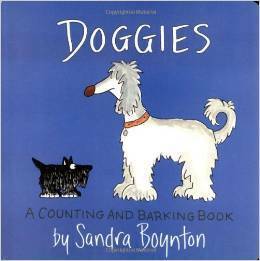 Right now, you can get Doggies – A Counting and Barking Sandra Boynton Board Book for Just $3.30 On Amazon! Super Saver Shipping will be FREE on orders of $35 or more or get FREE 2-day shipping with Amazon Prime.